In looking around podcasts on iTunes, you can imagine my delight when I came across one starring my favorite comedian, Chelsea Handler. My roommate Kaitlin introduced me to Chelsea and I’ve been in love ever since. Her podcast is full of clips from her nightly stand-up and celebrity interview show on E!, Chelsea Lately. If you haven’t tuned it yet, you definitely should. Chelsea is hilarious from beginning to end of her show, poking fun at celebrities and their sometimes stupid decisions. She’s sarcastic, witty and will say anything. With one of the highest rated shows on E! and three New York Times best sellers, Chelsea’s podcast and comedy in general are relevant to anyone who keeps up with celebrity news. While that may not be everyone, you can’t say you haven’t heard about the mess Charlie Sheen has become, which Chelsea talks about quite often. Her latest podcast episodes take jabs at E!’s reality plastic surgery Bridalplasty, the obsession with teen pregnancies in TV shows such as 16 and Pregnant and Teen Mom and MTV’s scandalous new show, Skins. Chelsea takes the regular celebrity news we see every day in magazines and news programs and puts a hilarious spin on it. She says what we’re all thinking but aren’t quite brave enough to say, and that’s why I love her. Now that I’m back in Stillwater and have some time not devoted to school, work or sleep, I have time to share about my wonderful experience last weekend in Oklahoma City. For those of you who don’t know, that would be the hilarious comedian Miss Kathy Griffin. We went to see her last Friday night in Oklahoma City, and she was wonderful and hilarious, as expected. What we didn’t expect was to be taking a picture like the one above with Kathy herself. 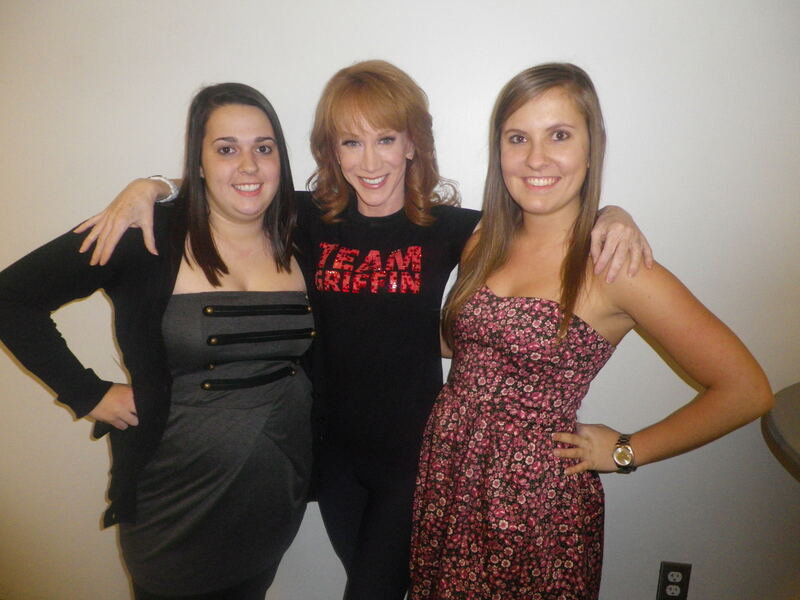 Kathy was super nice and friendly; she gave us hugs, said hi and told us she hoped we’d laugh a lot that night. It was short, but very sweet. I find this woman absolutely hilarious and I love that she doesn’t care what people think. She’ll say anything, and it’s awesome. I’m so glad I got the chance to see her live, and obviously ecstatic I got to meet her! I would say she’s my second favorite comedian next to Chelsea Handler… if and when I meet Chelsea, I might not be able to speak clearly. Ha! Speaking of Chelsea…my two favorite ladies on one show? Perfect! But back to Kathy! One of my favorite parts of her show was probably when she talked about all our crazy food here in Oklahoma. And it is crazy. Fried pickles, fried green beans, fried pies, fried anything you can think of really. She also mentioned our obsession for pizza with ranch dressing… those of you not from Oklahoma probably think all of this sounds disgusting. But I promise it’s so, so good…and making me a little hungry!